Life insurance can add up to a pretty penny especially if you’re not careful what you pay for. But it is one of those expenditures that you can live without but you would prefer not to. After all, a life insurance policy brings peace of mind with it but it should only do this at a reasonable rate that doesn’t overtax its way into your pocketbook so much that you start resenting it. First of all you have to know what type of life insurance you’re signing up for. Life insurance rates can vary wildly, depending on what you want in exchange for the money that you pay. 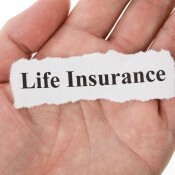 Generally, life insurance in general refers to ‘whole life’ insurance, that is, insurance that you pay for your entire life and that people get to cash out after you’ve passed away. There are other types of life insurance with much lower premiums but they expire after a set date and you get none of the money back. Recently a crossover version has arisen, where you pay a flat rate for your life insurance policy for a long period (5-20 years) and you can extend it to a whole life policy afterwards with no additional medical check. Yes, medical checks can be some of the more dramatic insurance hikers out there alongside bad credit ratings and a history of poor driving. Medical checks are used to determine the base rate of your life insurance in much the same way that they are used for health insurance. Things like being obese or even overweight, smoking, drinking or pre-existing conditions all raise your insurance premiums. However the things that raise life insurance costs the most are actually things that customers opt for. Add-ons or ‘riders’ can be tacked onto your policy for increased benefits and increased costs. And they can be quite useful: from allowing you to suspend payments while injured or disabled to paying you a part of your insurance in case of losing a limb, riders can provide the flexibility often lacking in some of the standard packages. Regardless of what you do, remember the golden rule: get quotes. Whole life insurance quotes can vary wildly from company to company, and on an individual basis as well. If you keep on searching for policies it is highly unlikely that you won’t find one that almost seems custom-tailored to your needs. If not, there are always riders. Just make sure not to pay more than you have to.